A Family Affair. 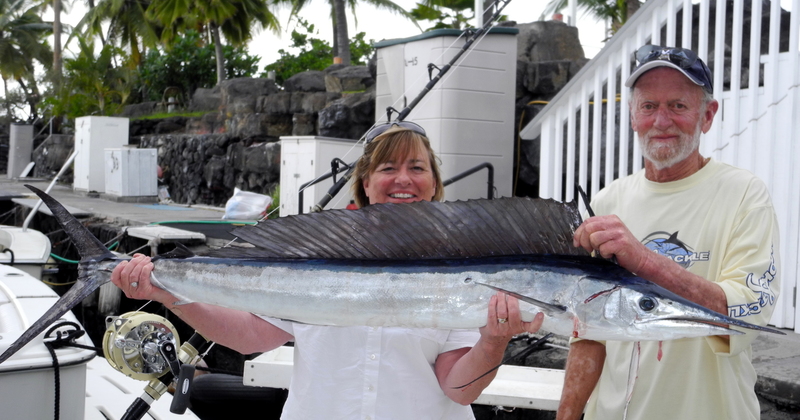 When Howard and Deb Tieden from Wasilla, AK booked their Charter they stated that they only wanted food fish. Any food fish. They see many trophies in their business and cater to guests in the same manner we do. The couple own and operate Arrowhead Outfitters in both Alaska and Texas. Howard is a Brush Pilot and Air Taxi, transporting guests to hunting and fishing camps in the two states. You name it, Moose, Texas Deer Wild Boar,Caribou, Bear, Sheep Fish and more. This trip was a Family Affair. Their Daughter Stephanie was getting married. As a wedding gift they booked the charter. Deb shared a story with me about carrying Stephanie in a backpack while hunting and fishing….so fishing is in Stephanie’s genes. With over a dozen family members wanting to fish, we had to have two boats available. Fire Hatt had the privilege of taking the Bride and Groom, the Tiedens along with the Grooms Father Leo Gunderson and Grandson Jason Gunderson. 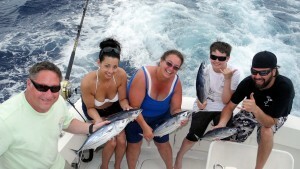 Captain Bill Casey aboard Pacific Blue took half of the group including Deb’s parents, Snooks and Kenny Moore . We had a mini tournament between the two boats to make it interesting. Game On! We started out in what we refer to as “Ono Lane” hoping to bag a food fish. 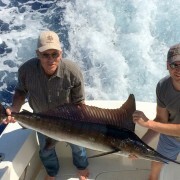 After several hours of no bites, birds or life we decided to move offshore to the pens and see if we could catch a few tunas. As we approached, we could see the Steno Dolphin there and knew our efforts would be wasted. So we moved off to “F Buoy”. Bingo, the first line in the water is bit. Jason Gunderson is on the rod and pulls in the first fish! Nice! We stayed for several more passes and the Stenos found us. 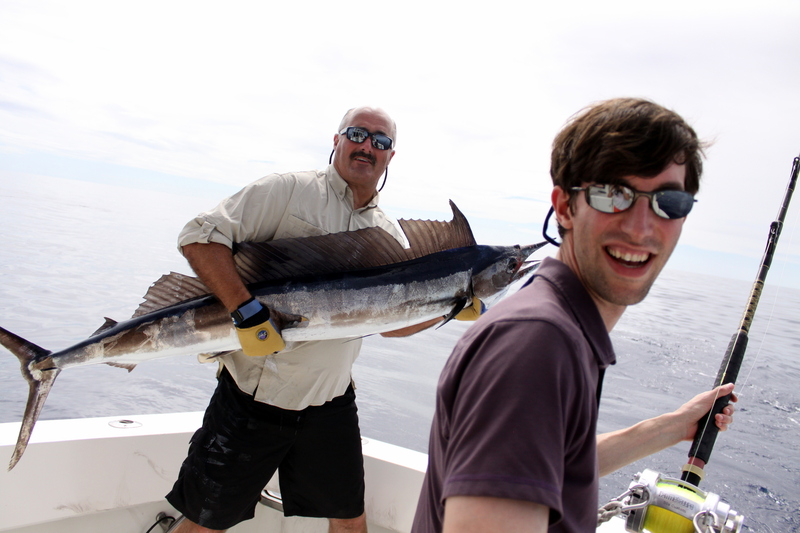 We couldn’t get any more fish to the boat without having them bit off. 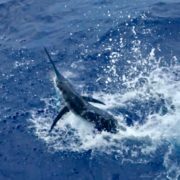 We head further offshore and put out the lures and hope for a tuna. After about an hour of trolling, the group decided they wanted to go back and take their chances with the Stenos and try for a few more small tunas. This paid off! 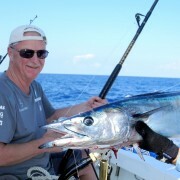 The Stenos had moved on and we were able to pull in several more small tunas. With time running out, we had to leave and head back to the harbor. 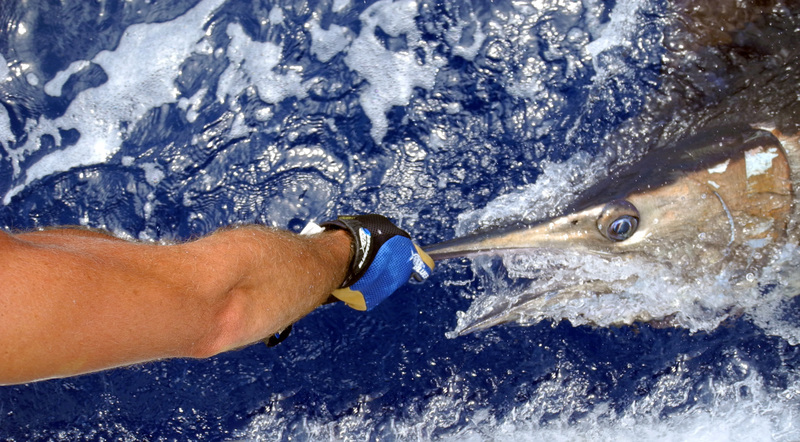 With lures back in the water we head in. About half way there, the long rigger line is bit! The line comes down and the fish comes off. We are able to tease the fish and keep it interested. 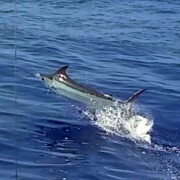 He takes a few more strikes at the long rigger bait and then switches to the stinger line. We are hooked up! 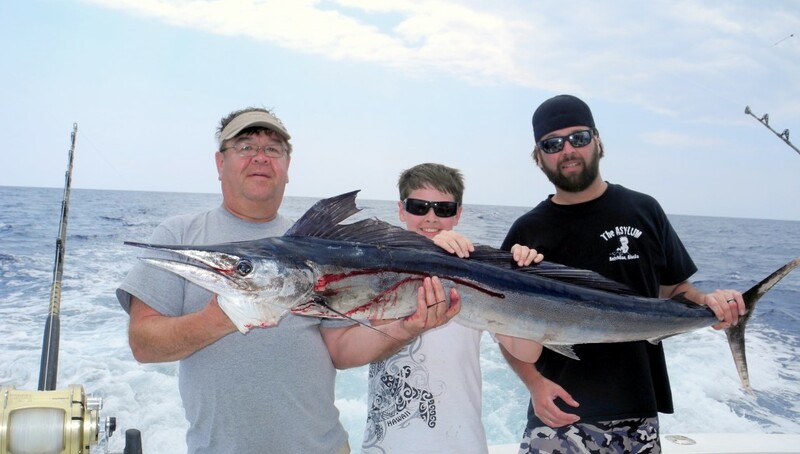 Larry Gunderson (AKA “The Groom”) is in the chair and makes for a short fight bringing in this 40 pound Short Bill Spearfish. Talk about a perfect finish for a day! Oh…we won this little competition. All in good fun!